Airway Meadows G.C. offers professionally run groups outings, corporate outings and charity golf tournaments. You will find the value added packages both helpful and competitive in price. References are available that you may call for feed back before you book a tournament here. We have developed a guide for the newcomer entitled "Simple Steps in Running a Golf Tournament" to get you started which we can provide upon request. Our course is close to Saratoga and Lake George area and offers a shotgun start to groups with 40 or more golfers. Airway takes on the responsibility of foursome organization, golf car line up, and placement of name cards on carts with starting hole assignments. The Airway Meadows staff offers to run check-in & provide information to the golfers at registration, handle no shows and assist with the reorganization of the line up and make announcements. Rangers lead out the players in an organized fashion. There is always Rangers on the course during play to assist around the course. We offer to do scoring for you, run all competition pins out to the course and return them to the scorekeeper, prepare a player note for everyone attending with schedule for the day, and do the entire food and drink services. Airway Meadows Golf Club can accommodate groups of up to 150 under our Tournament Tent shown in the photograph on this page. During most of the golf season dining will be comfortable and most enjoyable outside. When it is colder or if the group desires, inside seating is available in our Clubhouse Tavern for up to 65 people. Continental Breakfast selections are available, as well as lunch on the turn, appetizers, picnic lunches, BBQ Dinners & Buffets and Desserts. We will be happy to mail you a Tournament Menu upon request. Lunch on the turn packages are available in seven (7) combinations. They range from hotdogs and soda to sausage and peppers and sandwiches. BBQ Picnics and BBQ Dinners are also available for service under the Tournament Tent. Picnics range from Light Tournament Picnic of Hamburgers, Hotdogs, Salads and Soda for to Sausage, peppers and onions with hamburgers, hotdogs, salads and Soda for. Dinner BBQ's are available offering Smoked Kielbasa, Chicken dinners, Hot and Cold Buffets, Chicken & Steak to Prime Rib. Fifteen different dinner BBQ's are available. Our goal is to please your guests with our food and service. Each dinner is served with two or three dishes you select, such as salads, baked potatoes, or corn on the cob in season rolls and fountain soda. 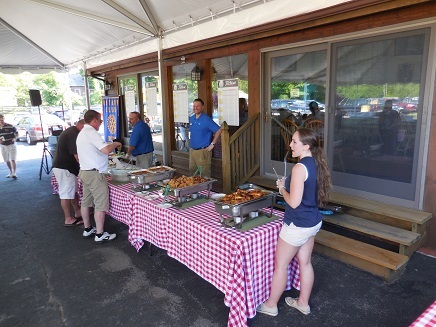 Our Clubhouse Tavern full service bar is always open during outings/tournaments. We can include in your dinner pitchers of draft beer and/or coffee upon request. Group Outings are quoted on an individual basis so as to meet your needs. Special arrangements can be made for charity events. Please telephone us at 518-792-4144 so that we discuss your expectations. "On behalf of the Wilton Rotary Club thank you for your generous support of our 10th Annual Wilton Rotary Golf Classic with the donation of the auction items. A total of $14,000 was raised for various charitable causes. Thank you also for all of the behind-the-scenes help you, Pro Shop Manager Kevin and the rest of your staff provide every year. You guys are the best! Thank you again for making this year's tournament such a success, and we look forward to doing it again next year!"